As QuickOffice quietly moves towards obsoletion, Google is doing its darnedest to integrate all of the deprecated app’s features into its office suite. If today’s massive updates to Docs and Sheets are any indication, the team is nearly finished. The biggest addition to both apps – native support for Microsoft Office file formats like .docx and .pptx – was announced at Google I/O, and it seems to work as demonstrated – apart from minor formatting inconsistencies, Docs and Sheets interpret Office documents fairly well. They can be created or imported – Office files opened in Drive/Sheets are fully editable, of course – and uploaded to Google Drive without limitation. Helpfully, the Docs and Sheets file list differentiate between Docs and Office filetypes. Both Docs and Sheets are now compatible with Android L, and appropriately have UIs more in line with the developer preview. They’re rather conservatively redesigned – it’s abundantly clear Google is carefully strutting the line between Holo and Material Design – but cleaner and more colorful. 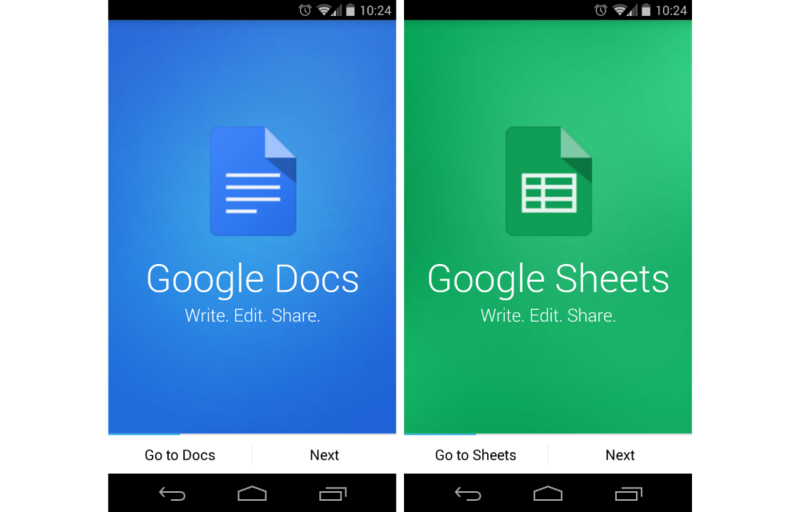 A blue titlebar and highlights adorn the Docs app, green for the Sheets app. A floating “new document” button makes an appearance in both. The features of the update extend way beyond Office compatibility and a tweaked interface. Some of the highlights include a new editing UI and better spellcheck in Docs, charts, formula lists, and autofill in Sheets, and the ability to send files as PDFs or Word or Excel documents. We’re waiting on official changelogs from Google, but we’ll update this post as we notice any other notable changes.